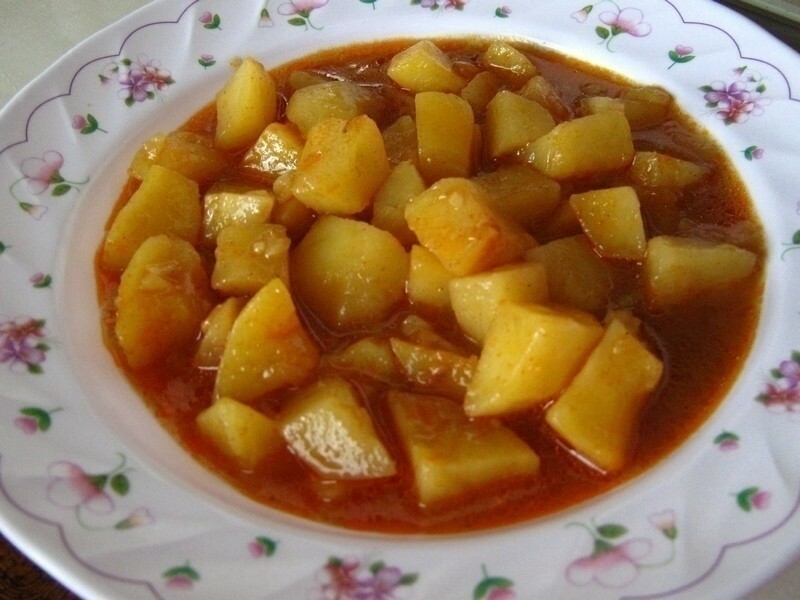 Potato goulash was the goulash for poor people. Those who couldn't afford meat cooked this dish, which has the original goulash flavor, without meat - so vegetarian also can consume this! Peel and wash the vegetables, and cut them up. 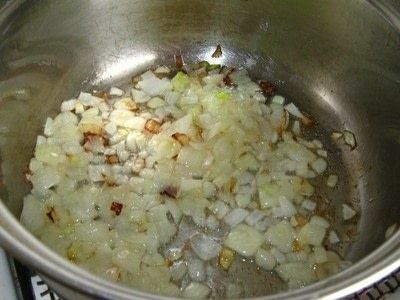 Caramelize the onions in the oil. 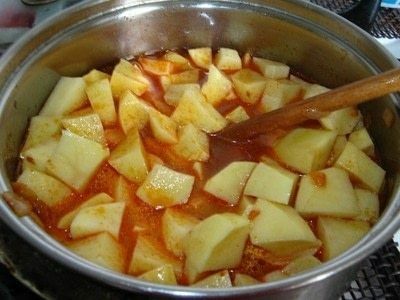 Put in the paprika, stir, then add the potatos, and stir again. Add water, almost the same level as the potatos. 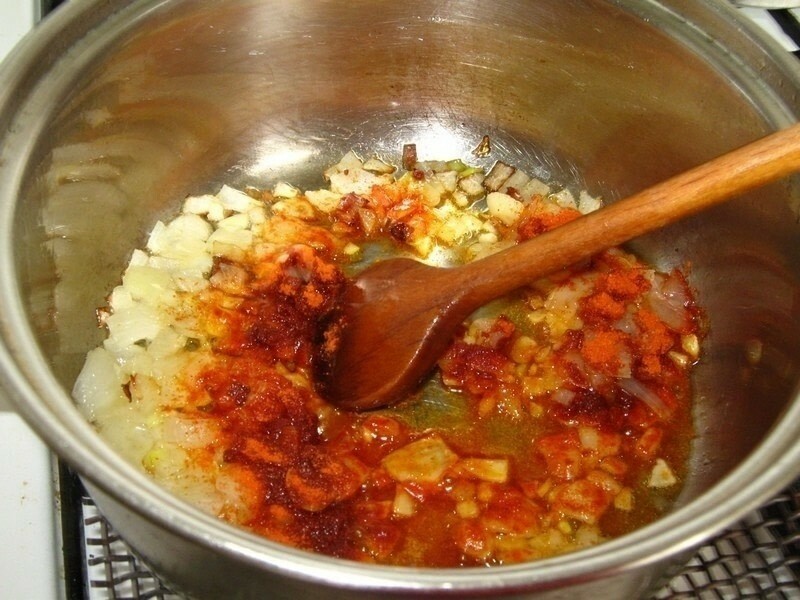 Add the seasonings - cumin, garlic, "Vegeta" or other food seasoning, soup flavouring cubes (I use chicken flavour), stir again. If you want some extra-tasty flavour, put something smoked in to it. 50-100 gram smoked bacon, gammon, sausage, turkey leg or anything you like. Cover the dish and cook the potatoes app. 25-30 minutes. Some eat this with bread and pickled cucumber, I prefer fresh salad. LOL Gotta love random internet fools trying to tell you how to do something from your own country! hahahaha. Tiffany, I am actually Hungarian and believe me, we put cumin and oil in many dishes. 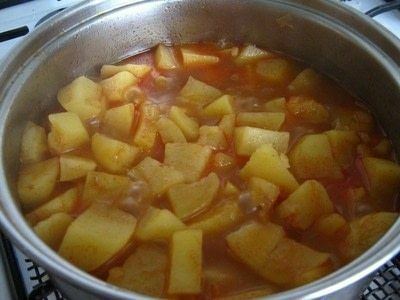 If fact, we have a specially cumin-soup. This soup contains nothing but water, flour and cumin and oil (or lard). Some put in eggs and call it egg-soup. Without egg the name is "rántott leves". "Leves" means soup, and "rántott" comes from "rántás" which means caramelizing flour in fat (oil or lard). We also put cumin in some vegetabele dishes (especially with cole or potatoes). Long time ago most of people used lard for cooking, but in the last twenty years (and I am 31 years old ) they prefer vegetable oil. NEVER EVER PUT CUMIN IN A HUNGARIAN DISH, or use oil. instead of cumin use caraway seed, and instead of oil use lard.